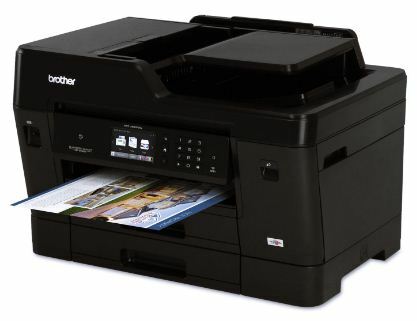 Brother MFC-J6930DW iPrint&Scan Driver Mac, Windows, Linux, Wireless Setup, Reviews- The Brother MFC-J6930DW is the multifunction printer that offers the fast performance and lower cost of printing. This inkjet technology printer is for color and monochrome printer. The maximum size of paper compatible to this is tabloid (11 x 17 inches). Then, this device also can be used as copier, scanner, and also fax machine. This is ideal for handling the mid-sized workgroup or small office printing needs. Brother MFC-J6930DW is equipped by easy paper handling with the capacity up to 500 sheets. For the automatic document feeder, the capacity is 50 sheets and the multipurpose tray is up to 100 sheets. The speed print of this printer is fast enough where for black page it is up to 35 ppm while the color one is up to 27 ppm. The maximum resolution is 1200 x 4800 dpi. Then, the auto duplex is also available where you can print, copy, and scan for two sides of sheet of paper. Then, as copier, you can copy the document both in monochrome and color. The based speed of the copier is 12 cpm black and 9 cpm for color. The first copy speed is 6 seconds from its ready mode. As scanner, it has capability to scan both black and color scanning with the maximum resolution 600 x 600 dpi. Then, this printer also serves as the standalone faxing machine with the modem speed is 33,600bps (Super G3). The connectivity features of this Brother MFC-J6930DW are quite richer. Wired and wireless connectivity are available. To and more flexibility when printing, copying, scanning, or faxing, the Wi-Fi feature can connect the printer with PC or mobile device. Thus, it is compatible with some software like AirPrint, Google Cloud Print, iPrint&Scan, NFC, Brother, etc. Similar with the Brother printer in other series, the Brother MFC-J6930DW also uses INKvestement cartridge system with super high yield ink. There are four base cartridges that offers high capacity –black, cyan, magenta, and yellow. When the inks run out, the replacement cost is quite inexpensive. Therefore, this printer can help you in producing the good quality and lower cost printing at once. Paper Handling Size - Paper Tray Letter, Ledger, Executive, Envelope (Com-10, DL Envelope, Monarch), A3, A4, A5, A6 Photo 4"x6", 3.5"x5", 5"x7", 5"x8", Manual by-pass: 3.5" x 5" to 11" x 17"
Recommended Paper Brands Brother Ledger Plain Inkjet Paper (BPPLGR), Innobella Ledger Glossy Paper (BP71GLGR), Innobella Glossy 8.5" x 11" Photo Paper (BP71GLTR); Innobella Glossy 4" x 6" Photo Paper (BP71GP20).